If you are working as a Linux System Administrator or Linux System Engineer or you are already a Storage Engineer or you are planning to start your career in field of Linux or you are preparing for any Linux Certification Exam like RHCE or you are preparing for Linux Admin Interview then the the understanding of Concept of RAID become so important for you along with its configuration.RAID can be configured in LINUX or Windows but here we are explaining RAID configuration on LINUX machines. Altough we already have explained you about the concept of RAID along with configuration of software RAID0, Configuration of software RAID1 ,Configuration of software RAID5 and software RAID configuration on LOOP Devices. This time we are going to explain you here about the concept and configuration of software RAID10 step wise in detail.We will learn how to configure software raid, how to examine raid devices, how to see the detail information about raid devices along with active components.We will also learn how to replace and remove faulty devices from software raid and how to add new devices to raid.We will also see the step wise command how to stop and remove raid device by removing raid10 device here.We go the through the process of RAID Recovery and Restoration and learn raid recovery on the command line because it become so important to understand how to recover your data and restore your raid after an unfortunate disk failure. Let's have a word about RAID10 before it's configuration. Minimum number of devices needed to configure software raid10 is 4. RAID10 is actually a combination of raid1 and raid0. So you can say it has property of both raid1 and raid0. i.e it provides redundancy with performance. So here we are using four drives(/dev/sda7 /dev/sda8 /dev/sda9 and /dev/sda10) to create a virtual device called /dev/md10. User create and keep it's data on virtual device(/dev/md10) which is actually a raid device which is mounted on /raid10 directory here. Step1:Create 4 partitions that will be used in raid10 and then update the kernel with this change in partition table using fdisk and partprobe command. here instead of four different hard disk we are taking four different partitions /dev/sda7 /dev/sda8 /dev/sda9 and /dev/sda10 for just learning the configuration of software raid10. But when you work in real environment you need to take four different hard drive instead of partitions to configure and use software raid10. 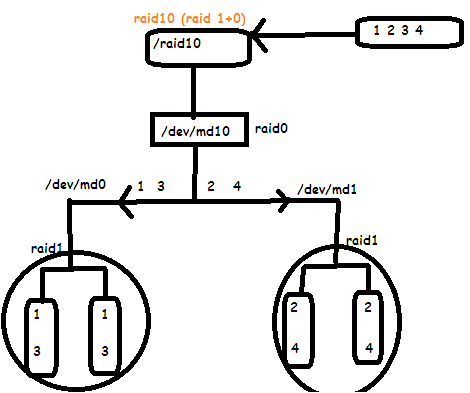 Since we are creating these partitions for raid use that's why we need to Change the partition type to raid first before we use it for creating raid10 array. we may need to reboot the system to save this change in partition table, but if you don't want to rebbot just use partprobe command to update the changes made in partition table. Step3:Create RAID10 Device using mdadm command. Review the basic information about all presently active RAID Devices. You can see in above output the all four drives are sychronizing.The drives are 25% syncronized yet only and after few minutes it will be completely syncronized. Syncronization time depends on the size of drive and data in the drive.So it will be different for different machine and different drive. To examine the RAID device in little more Detail use below command. Another alternative method to see information about raid devices. /dev/md10: 1907.25MiB raid10 4 devices, 0 spares. Use mdadm --detail for more detail. /dev/md10: No md super block found, not an md component. Other Method to get information of any raid devices. If you want to display array lines for a particular device only you can use this command. here we want to see the details of /dev/md10 array only. Examine the component of RAID Device. 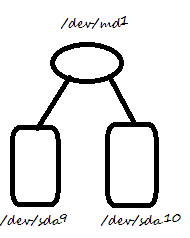 Step5: Fornmat the Raid Device with the filesystem of your choice. here we are going to format the Filesystem with ext3 type and mount it using mount it and also complete the process of permanent mounting by making an entry in /etc/fstab file. Now mount the raid device and then check that it works. Now for permanent Entry go inside /etc/fstab file and type the following at the end of file. Now it's time to check whether your raid devices is properly mounted or not using df command. Now check raid10 setup after mounting that whether all devices are properly working or not using mdadm command. We can clearly see that raid10 is active it means working properly. we can also see its components devices /dev/sda7 /dev/sda8 /dev/sda9 and /dev/sda10 all are ok, There is no any faulty device yet here. For demonstration we are going to Simulate a damaged or lost disk. REPLACING FAULTY DEVICES FROM RAID. Note;if you want to replace a faulty device from software RAID device, first you need to make it as faulty device and then you need to remove that faulty device.What i want to say is to fail the device first and then remove it from raid. Example:For eaxample here we are going to learn how to remove a faulty device say /dev/sda10 here. step1:To replace faulty device /dev/sda10 first we need to make it faulty device. In case of device failure crashed disk are marked as faulty and reconstruction is started immediately on the spare disk if available. Now check it whether it becomes faulty device or not using mdadm --detail command. We can see faulty device still appaer and behave as the member of raid array.This is because the raid array treat the faulty device just as an inactive part of raid array. Now we can clearly see that /dev/sda10 is now a faulty device. Raid devices is still 4 because the device /dev/sda10 is failed only but not yet removed. Total devices is still 4 because failed device is also a device. Active devices and working device=3 because now failed device /dev/sda10 is no more available for use. Failed Device=1 because we have only failed one device that is /dev/sda10. step2:Now it's time to remove the faulty device /dev/sda10. To see removal confirmation use mdadm --detail command again. Here you can see /dev/sda10 is no more. Raid devices=4 but total devices=3 because one device is now removed from raid. active device=working devices=3 after removing one device /dev/sda10. Above output also clearly show that now only there is 3 device remaining active in raid10. RECOVERING and RESTORING a RAID. For testing purpose we are going to add /dev/sda10 to existing raid /dev/md10. Add new replacement partition to the RAID. It will be resynchronized to the original partition. Check whether device is added or not. We can see synchronization started.When the rysync completed your RAID Stored. Depending on the size of your Filesystem and bus speed the synchronization could take some time. You can spare rebuilding option. How to Stop and Remove RAID. step1:Remove permanent mounting.Remove or comment the line in /etc/fstab file. mdadm: md device /dev/md10 does not appear to be active. step5:Now remove the partitions used in raid array. Learn alternative method to configure software raid10. We can configure software raid10 by configuring raid0 over two raid1 device. Step1:Let's firts create raid1 device /dev/md0 using /dev/sda7 and /dev/sda8 first. You can check your raid status now. Step2:Now similarly create another raid1 device /dev/md1 using /dev/sda9 and /dev/sda10. Now you can check your raid devices status. You will find now two raid1 devices /dev/md0 and /dev/md1. Step3:After creating two raid1 devices(/dev/md0 and /dev/md1) we create raid0 device(/dev/raid10) over these two raid1 device. Now you can see your raid device status again you will see 3 raid devices now md0,md1 and md10. Step4:Format the raid device(/dev/md10) and mount it and check it. If you want to make it permanent you can make an entry in /etc/fstab file. To see list of all raid array present in your system you can use below command. To see the detail information of your newly created raid10 device you can use below command. Any suggestion related to this article is highly appreciated. is the level in this cmd =10 is correct or it should be level 0?? ?